Will Sheff’s promo run for the new Okkervil River album The Silver Gymnasium has been all about keeping it local. Before lead single “Down Down The Deep River” debuted, Sheff and his childhood friend Aaron Johnson took it to different open mic nights in New England near their hometown Meriden, NH. 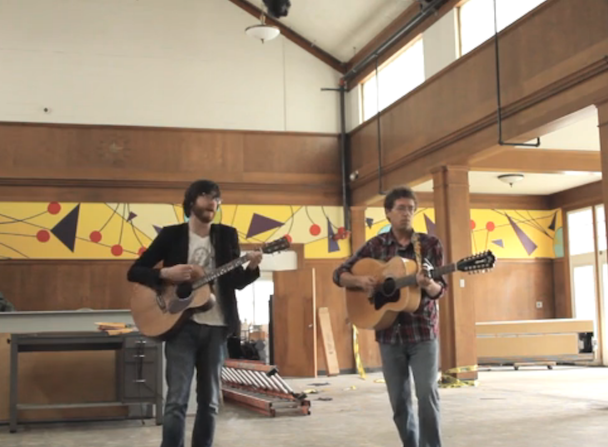 In this new video, Sheff and Johnson return to their former high school there to discuss their first bands and perform Silver Gymnasium tracks “On A Balcony,” “Where The Spirit Left Us” and “Black Nemo.” Check them out in the cafeteria below. The Silver Gymnasium is out 9/3 via ATO.